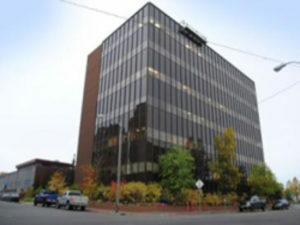 This Virtual Office is located in Anchorage, Alaska the most northern city of the United States. Very close to the coast line and less than 20 minutes away from the airport. Virtual Office Anchorage Alaska is situated very close to the coast line and less than 20 minutes away from Anchorage International Airport. The city is the northernmost of the United States and the most populous in the state of Alaska with close to 40% of the states total population, only New York has a similar density. Officially named an all American city for several years, Anchorage has also been declared as one of the most tax friendly cities. The beautiful A-Class building is designed to serve the professional needs of modern businesses and does not lack the high tech environment many traveling business man require. If you need an extended arm of your company in the very north, the Virtual Office Anchorage Alaska might be your first choice. The shared reception area as well as meeting rooms and day offices are at your disposal, just when you need them. Our staff on side will represent you in your companies name and if you want we will also take phone calls for you or assign a virtual assistant for the every day office task. Our executive suites are also available for you to rent on a contractual base if you require physical office space on a permanent base. Getting started with a virtual office is done completely online, once you have entered your data we are working on having you completely set-up in less than 24 hours. If you like to preview the location, kindly indicate so by asking a pre-sale question below or call 1.866.793.7969 and we will arrange a tour for you with a manager at the location.